I’m using yellow split peas for this Indian dal. Yellow split peas are high in protein and fibre while low in fat. I partly grew up on these peas. Every Thursday night my mother served a traditional Swedish meal consisting of her home-made yellow pea soup followed by her sublime pancakes. It’s funny how we use the same kind of ingredients in such a different way in different countries. While it’s common to add cardamom to Indian food – I’m using it in this dish – in Sweden people add it to cakes and buns. I love Indian dal. I ate a lot of different version on my travels in India. It is comfort food, food that leaves me with a warm and cosy feeling inside - just like my mother’s Thursday dinners did once upon a time. 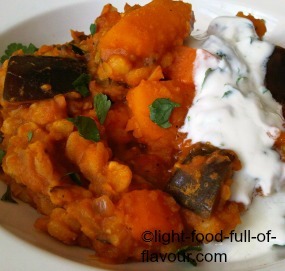 I like to add lots of different vegetables to whatever dal I’m making - to make more of a meal of this dish. This recipe will make quite a lot of dal. If you serve it with quinoa or rice it will easily be enough for 6 people. I serve this Indian dal with lots of steamed green beans - tossed with a bit of oil and lemon zest – and natural yogurt with chopped fresh coriander. 1. Start by rinsing the yellow split peas thoroughly under plenty of running cold water, until the water runs clear. Place the peas in a pot and cover with 1000ml, 4½ cups, fresh cold water. 2. Open the cardamom pods and take out the seeds. Place the seeds together with the cloves in a pestle and mortar. Grind to a fine powder and add to the pot with the peas together with the ground ginger. Stir well and bring to the boil. Skim off any scum that rises to the surface and reduce the heat. Simmer the peas for 40-45 minutes – until most of the water has evaporated and the lentils are tender. 3. While the peas are simmering, heat the oil in a large pot over a medium heat and add the mustard seeds, cumin seeds and dried chilli flakes. As soon as the seeds start to “crackle and pop”, add the remaining spices and the chopped onion. 4. Stir and cook for 3-4 minutes before adding the carrots, butternut squash and aubergine. Keep on stirring and cook for a further couple of minutes. Add the chopped tomatoes and water to the pot, season with salt and pepper, stir and bring to a simmer. 5. Leave to simmer for 40 minutes (add some more water if it gets too dry), stirring every now and then to prevent the vegetables from burning at the bottom of the pot. When the yellow split peas are cooked, add them to the pot with the vegetables. Stir and continue to cook for a further 10 minutes. Check the seasoning and add a bit more salt and pepper to taste.